As you all know I wanted to make an Sapphire R9 380 Nitro(review of the card) volt mod guide. However me being me I royal messed up my R9 380 and had to leave for the UK before I fixed it. However a kind gentleman on Facebook has provided PCB pictures. They aren't exactly what I need however they are good enough to do the guide with. Lets get to it. DISCLAIMER: Everything past this point will void your warranty! If the GPU stops working due to you doing any of the things described bellow I am at no fault what so ever. So first lets breakdown that PCB into what's important. There isn't much to modding the card. Hook some sensing wires to the memory and core voltage VRMs and pull a GND from where ever you want to. I highlighted some good candidates in brown. First up core voltage and core current limits. The current limit is simple to disable just cut the 2 traces highlighted in green. Now your card will think it's pulling 0W regardless of what the powerdraw actually is. So power related throttling is history. However it does make it easy to blow up the VRM by running Furmark since there is nothing to stop the card from pulling too much power. This should only be a risk when going over 1.45V core voltage. To cut the traces I suggest digging into them with a needle. 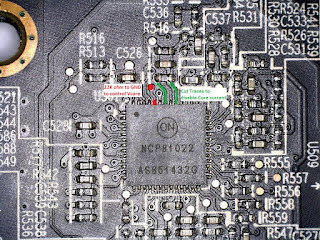 This picture also shows how you could try modding core voltage however I recommend that you avoid soldering onto a pin or trace because it is really hard to not screw up. Instead solder a 22K(+/-5K) ohm variable resistor from the red point to ground. This will give you free control over core voltage. I recommend not going over 1.35V on air cooling for daily usage. For benching 1.45V is my ceiling. More than that seems to rapidly degrade 28nm GPUs. The VRAM is an easy mod. All you do is hook a 220K(+/-50K) ohm variable resistor from the pin highlighted in orange to ground and you'll have VRAM voltage on manual control. There is no power limit for the VRAM so you don't have to worry about that. I don't rember the stock voltage of the VRAM on the 380 but don't go over 1.7V for daily usage. On sub zero 1.85-1.95V should be optimal. Use a fine chisel tip for all the soldering. A needle tip will make everything much harder because the tip of the pen won't actually melt anything. If you have a temperature regulated iron set it to 240-250C for everything. When you finish soldering one of the connections to an SMD component I recommend using plastidip to hold it in place. Hot glue is harder to apply without breaking a weak soldering joint and is very bulky which might prevent you from fitting the heatsink back on the card. If just 200 of you were to donate 5$ I would be able to do almost any GPU you're interested in. Hey there, excellent write up! I have a couple questions about the mods. First off, I have an R9 285 (XFX BE DD) which is the same Tonga architecture. If I take off my heatsink and the PCB appears the same or very similar, is it safe to make the same current limit modification you have made here? When I say safe, I don't mean that there is no risk - just that I am not needlessly risking the card for a modification that will never work. I have just upgraded to a Fury X in my main rig, so I'm not too worried about tinkering with the 285. I do like the idea of squeezing the most power possible out of it though. I am thinking about liquid cooling it in a very small HTPC setup. Second, if I am planning not to feed my core any more than 1.35v, can I simply add 200mv using Sapphire TRIXX's voltage controls? (+200mv is the max on the slider, and my core voltage sits at around 1.13v -1.15v when benching at standard clocks.) Or, is that number just being displayed by the software and overridden at a hardware level? Keep up the great work! I can understand why AMD has applied these hardware maximums, but they could have set them quite a bit higher safely. Even though they are set very low, card owners who aren't overclocking won't be hitting these limits. Why lock out the only people who are already willing to take the risks, the overclockers? 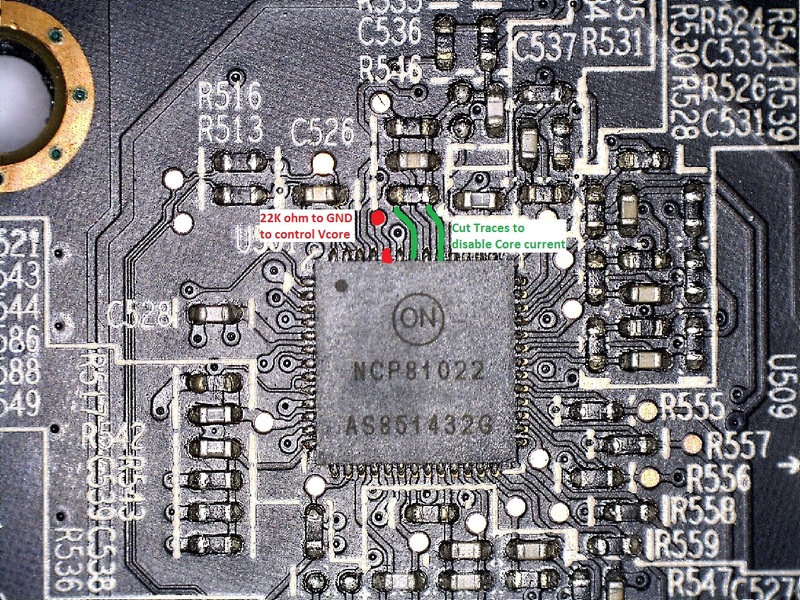 If the controller your GPU uses is also an NCP81022 you can turn of the power limit by cutting the same pins yes. These limits could probably be broken via software. However my knowledge of circuits is infinitely larger than my knowledge of BIOS modding.